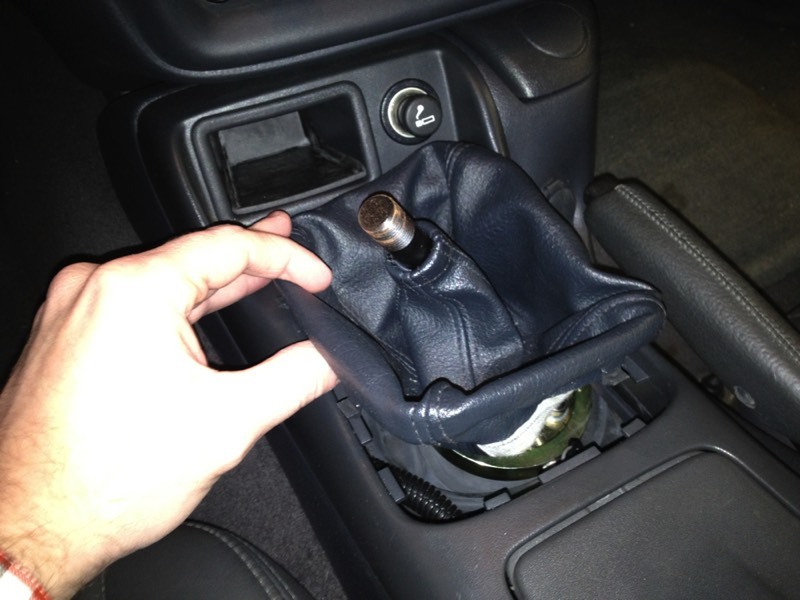 Locate and remove the shift knob on your shifter. Most likely will require you to turn the shifter knob counter clockwise. Locate and remove the leather boot on your shifter. Be careful when remove the leather boot as the plastic frame tends to break. Not a big deal but just quick downer when starting the install. Mine has been broke for many years and I never remember until I take the boot out. Before we go any further. You need to be sure that the car cannot move out of gear. You must chock the tires, be sure you are on level ground, and are in no danger of moving while you are performing this installation. Locate the emergency brake. We want to position the brake handle in a vertical position. This is accomplished by using a flat head screwdriver that is at least 6" in length. Separate the rubber flaps and you will see a metal piece that appears gold in color. That is called the "pawl." 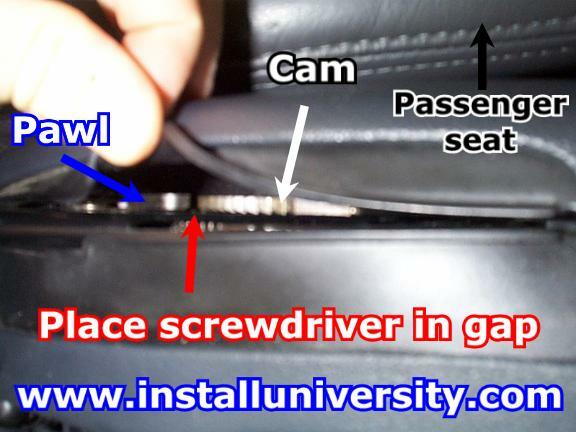 You will need to slide the edge of the flat head screwdriver in between the pawl and cam. Once you have the screw driver between them, the handle easily slides up to a 90 degree position. Open the ashtray and remove the plastic tray inside. Gently lift it it out of the console. Locate the light bulb in the ash tray compartment. Be careful when removing the light bulb. It will get hot if it has been on for extended lengths of time. Remove the bulb from the ash tray compartment by squeezing the plastic tabs together. Let the bulb assembly fall down underneath the console. 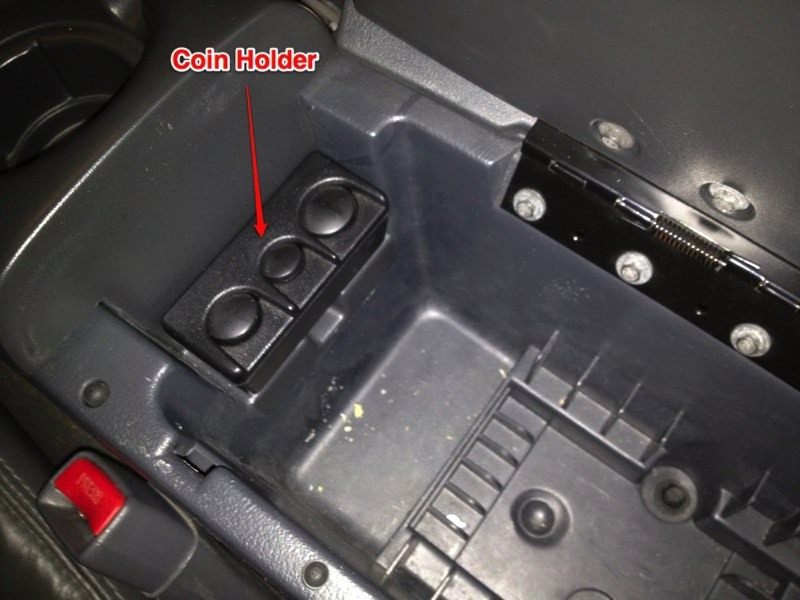 Open the console storage compartment and remove the coin holder by lifting straight up on it.